Moving from the realm of novice to pro often comes with a jump into a different tier of equipment. Whether you are working with computers, cars, paintbrushes or paddle boards, the differences between good and great can be tiny, but profound. 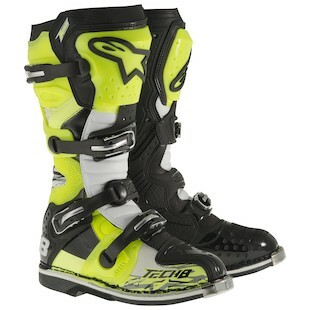 In the case of motorcycle boots these features can be seen in the Alpinestars Tech 8 RS Boots. With an inner-sleeve constructed of leather and 3D mesh, it offers a comfortable option that at the same time incorporates adjustable shock absorbing gel inserts to protect your heel. In addition, a removable anatomic footbed allows for even more comfort when you are putting the boots through their paces. With all of the comfort in mind, however, do not think for a second that these boots are not built to protect. With beefy, reinforced lateral flex zones, extended internal protection plates, and an upgraded buckle system, the new Tech 8 RS boots keep you locked in and armored up for the most ardent of usage. For the hotter days and warmer climates, the same boot is also offered in a perforated options. The Alpinestars Tech 8 RS Vented Boots afford all of the same protection and comfort as the Tech 8 RS, however, they are geared to keep your feet cooler as you take on the trails. If you are looking to step up your moto game and push yourself to the max, upgrading to a professional level piece of gear might be in our future. 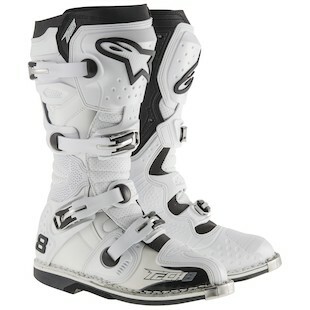 For offroad motorcycling the Alpinestars Tech 8 RS and Alpinestars Tech 8 RS Vented Boots offer a great option in that regard.